Two easy spoon bending tricks explained. Simple street magic to amaze. Spoon bending has fascinated people for a good while now and still has a great sense of mystery to it. Uri Geller popularized it when he appeared on global television in the 1970's where he claimed to bend spoons using the power of his mind. 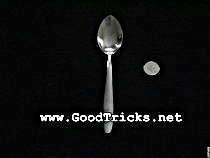 Two easy methods are shown here to simulate the art of spoon bending magic. 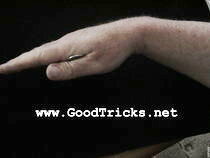 They are easy to learn and make good impromptu magic tricks. Simple street magic for the beginner magician. Learn a great trick for restaurant or bar entertainment. The magic instruction video below here shows the tricks being performed and then reveals the secret. A little time and patience put into practicing the two tricks should be well rewarded. Although the spoon bending tricks are relatively easy to do, like most routines, they benefit from a little practice. These are the items that you will need to perform this cool trick. Hide the silver colored coin in between your thumb and first finger. Hold spoon near the bowl as shown with your hand that does not have the small coin hidden in it. Bring other hand with concealed coin over the spoon handle. Make sure that a little of the coin is visible. Your audience should think that the coin is the end of the spoon handle. Bend this hand up a little and it will look like the spoon is bending. Continue to bend this hand back and forward. Be careful of your angles and be careful that your audience cannot see the real spoon handle which should remain hidden from view. After a few bends back and forward. The spoon can be presented for inspection in its original condition. The coin in the other hand should be sneaked into your pocket.